Cosworth’s ESG module offers 16 differential, ratiometric strain gauge inputs with common excitation and sense lines in a compact and rugged IP67 aluminium housing. Alternatively, the module can be configured to provide 8 inputs with individual excitation and sense lines. Resolution is 24bits, with outstanding accuracy (+/-0.03%) and repeatability. Sampling is simultaneous on all inputs and rates go up to 2kHz. 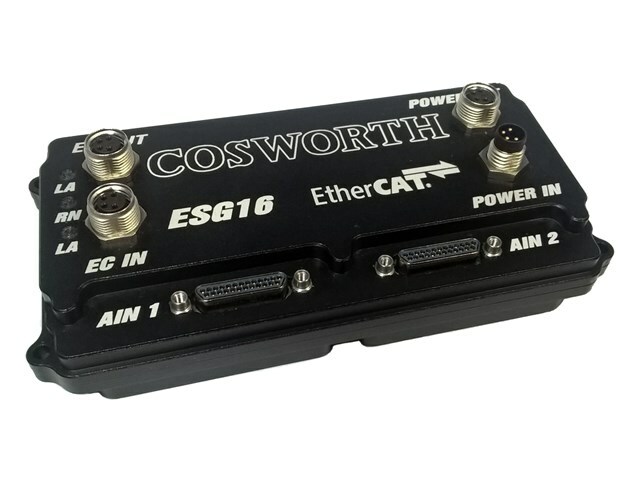 The interface to data acquisition systems, including Cosworth’s Pi Diablo, is via EtherCAT®. This is an open and widely used industry standard offering high speed and sub-microsecond time synchronisation. Input connectors are pin-compatible with Mistral IJB Type B/C/G/H/I inputs. Both the power and EtherCAT® connections use industry standard M8 connectors. Individual inputs can be configured as build option to one of five sensitivity steps between +/-0.24mV/V and 3.89mV/V. Bridge excitation is 5VDC.